Want to immediately improve the functionality and appearance of a home? A bathroom remodel will do just that. When your client needs assistance creating a warm, inviting bathroom design, turn to the experts at ProSource® of Fenton to find all the bathroom remodeling products you need. We can assist you with choosing materials, building a design, and matching the right products for your client’s budget. 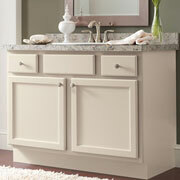 Stop in to learn how you can create a bathroom that increases the value of the whole home. Need to upgrade an old, faded sink with a new, modern piece? 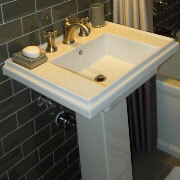 We carry bathroom sinks that compliment any style. From traditional and basic to ornate and modern, we have something for everyone. 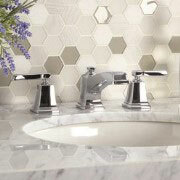 A faucet adds functionality and flair to your bathroom sink. When you need help choosing the perfect faucet to meet your client’s unique taste, we can help. Browse top brands and find an affordable option today. An important part of a bathroom remodel is taking out large components like showers and upgrading them with new and beautiful products. Don’t let a shower break your client’s budget, shop showers at wholesale pricing at ProSource of Fenton. A vanity can hold all the grooming essentials with added space for other important items. A useful piece for small bathrooms in need of extra storage, we can help you find the perfect vanity for your next remodel. 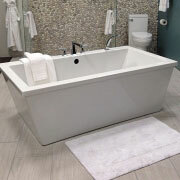 Whether your client is looking to bathe in the lap of luxury or simply to replace a leaking tub, we can help you find a model that fits their space. Talk to us about what style, color, and material is right for you. A toilet can be so much more than just another functional element. 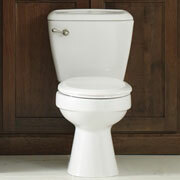 Talk to us about finding a toilet that will bring an extra touch of beauty to the room.